Being a guarantor basically means that you promise to make the loan repayments if the borrower doesn’t pay. Guarantor loans aren’t a new concept, it’s how banks used to lend before computer credit scoring took over. It’s quite common for landlords and mortgage companies to still ask for guarantors today. We believe asking for a guarantor is the best way to lend as your family and friends know you better than a computer ever could. If you trust someone enough to guarantee their loan, then that’s good enough for us. You’d lend the money to the borrower yourself but you want them to manage the loan themselves and make repayments to us rather than to you. You can’t lend the borrower the money yourself. You want to help the borrower build up a good credit score for themselves and put them in control of their finances. 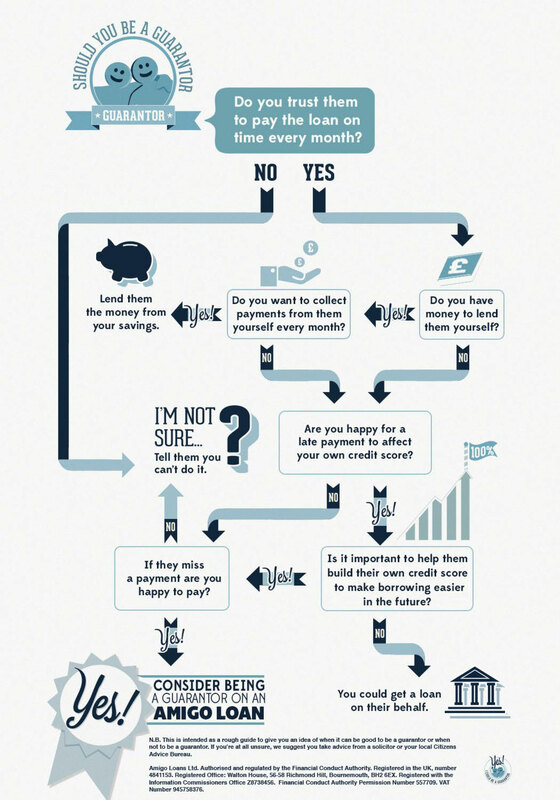 We’ve designed this flow chart to help you decide whether being a guarantor is the right option for you. You can either sign and return the paper forms, if we've sent to the borrower, or enter your “amigo.me” link above and complete the online application. Loans are paid out into the guarantor’s bank account. This is to prevent fraud and give you the option of changing your mind before you transfer the money to the borrower. After payout we send you a copy of your contract and a letter confirming payment dates. What happens once I’m a Guarantor? You’ll receive monthly statements by post, however, you can opt out of receiving these if you would prefer. You’ll be able to check the loan balance and statement, update your details and make payments at any time online by logging in using your email and password. If the borrower makes payments on time you won’t be asked to do anything more, except update us if any of your details change. You should read our 10 promises about how we deal with missed payments. If a payment is missed we’ll inform you within 24 hours by text and email. We’ll always attempt to collect the payment from the borrower by Direct Debit and then by card. If we aren’t able to take payment from the borrower by these methods, we will contact you both as soon as we know. We’ll always try to collect from the borrower first, but if we can’t resolve it with them, or if we can’t get hold of them for two weeks, we’ll contact you to tell you, and then will collect the payment from you. We will look at your credit file to make sure that you are financially stable and haven’t had trouble paying back your bills in the past. This is a special type of search called a “Quotation Search”, which will not affect your credit score held with the credit reference agencies. Anyone searching your credit file wouldn’t be able to see if you’re a guarantor on an Amigo loan, or even that you’re linked to the borrower. We write back details of the loan to the borrower’s credit file with all 3 major credit reference agencies. If paid in full and on time this could help them to build their credit score and eventually they’ll be able to borrow from other lenders.